My daughter is the most important person in my life. I know this is deep inside me because I choose to have her. I’ve also chosen to parent her in a way where she is as much my guide as I am hers. I have learned so much about my life and my ways watching hers – how free and open she sees the world – without the baggage and hinderance of unmet needs, wants, desires, dreams… I tell her I was waiting for her to be born and my life completely changed when I met her – I had never felt such love for another. Yet, lately, I haven’t shown this to her and she doesn’t feel she is as important as other things in my life – such as my computer. I’ve been focused on my blog. There is a part of me that wants to do the best I can in everything I do. I have a hard time striving for less. This precision has helped me in life career wise – but that was when my life didn’t include my daughter. Last night, Mishy and I played a game. She stayed in the bedroom while I was in the living room. I had to be on my computer – she would periodically come and check to make sure I was. She then called me from the bedroom and when I didn’t come, she would run to the living room softly – we have neighbors underneath us – grabbed my hand and dragged me into the bedroom while I would say, “I’m working. I have important things to do!” She’d respond, “Someone wants to see you.” And I would say, “Who? Who is taking me away from my work?” By this time, we would be on the bed and she would look in my eyes and say – “Me!” And then I’d say – “Of course! What was I thinking? You’re the most important person in my life!” Then we would hug and I’d say – “Who is more important? The computer or Mishy?” She’d say, “The computer.” And I’d say, “Mishy! Mishy’s the most important person in my life.” We’d talk about how I was waiting for her to be born while she cuddled in my arms. 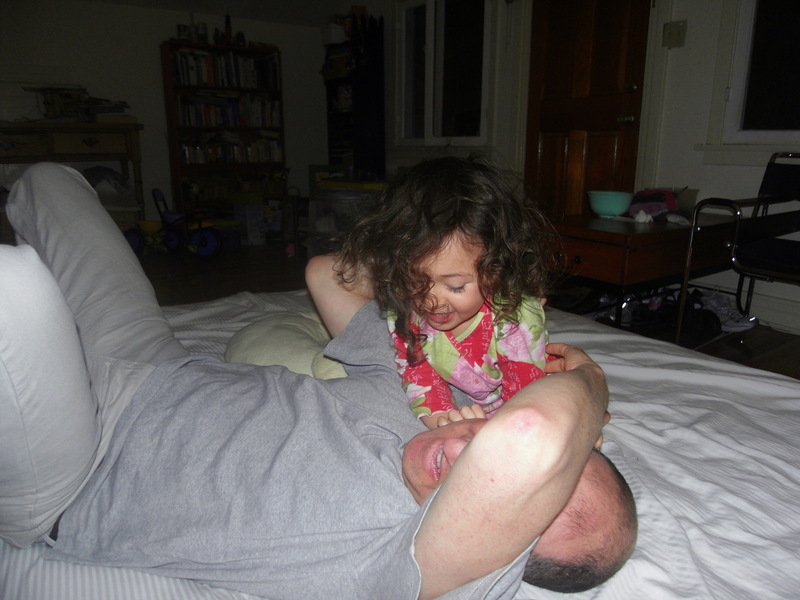 And we played the game again and again as she laughed and jumped and hugged and sweated. She was releasing. We played the game for as long as she wanted to and towards the end, she’d say – “Mishy! Mishy’s the most important person!” And she is. Now we have an understanding – I will be on my computer when she’s sleeping. I can check throughout the day when she’s playing by herself, but for the stuff that requires more time – when she’s asleep. She still naps. It’s not a problem. We’ve been researching pre-schools which has been emotionally draining since I love being with Mishy. What is the rush? What has been useful in attending the pre-school tours? Seeing their facilities and what their program offers. Most are centered around creative development primarily through art which lead me to read Bev Bos – thank you, Ninette, a mother of two, for the recommendation! Bev Bos is an educator, grandmother of four and mother of five. She is the director of the Roseville Cooperative Preschool in Roseville, California. She has several books published which all extends her child-centered techniques. Her first book, Don’t Move The Muffin Tins, a hands-off guide to art for the young child. Here are condensed versions of her rules which are in the book. Rule #1: Don’t interfere. Forget how you intended the art materials to be used. There is no right or wrong in art, just creation. Rule #2: Try one yourself. Build a trial version in your set up. You’ll be much more at ease with your child’s first attempt. Rule #3: Put the child first. Each day is special to a child. 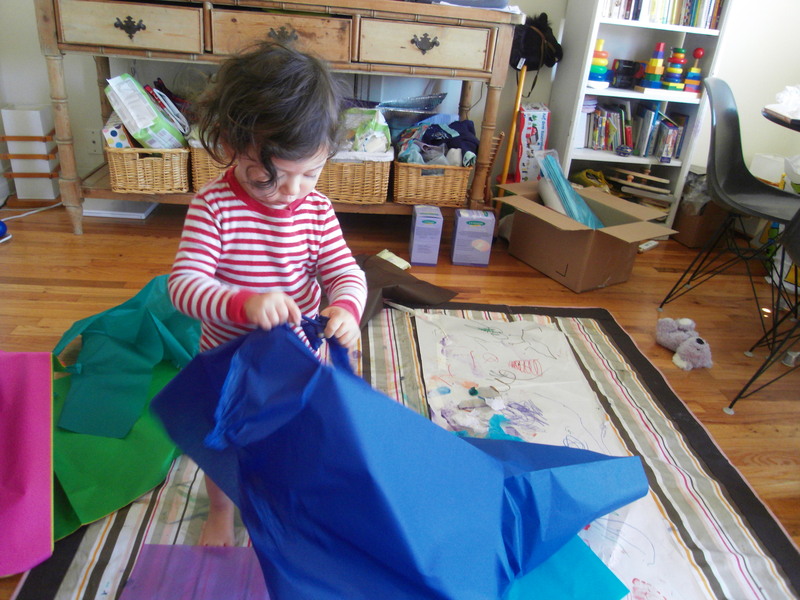 When a child asks for materials that are alternatives to what you’ve set out, provide those materials. Rule #4: Avoid models. Never make a model to show to a child. Let them create without the intimidation of a model. Rule #5: Respect a name. If they want to put their name on their creation, let them find the place and how they want it to look, even if it’s spelled backwards. 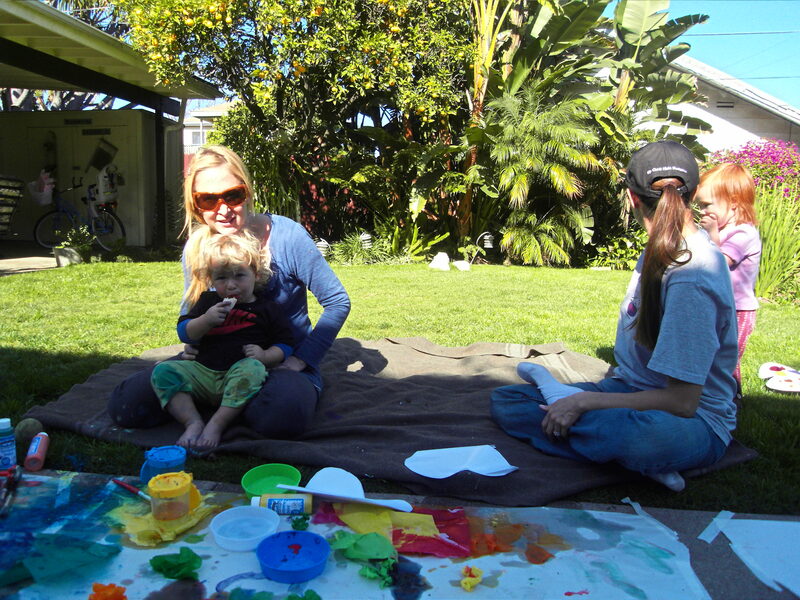 Rule #6: Art of young children should be “instant.” A young child wants to see immediate results. Rule #7: Spread the word. Orient parents to a child-centered approach. Make it clear you don’t want “art” produced for your benefit, but rather a program that is aimed at developing your child’s creativity. Rule #8: No leaping, please! Adults leap upon a child when something starts to spill, tip over, all from the table, or simply begins to go in a direction different from the one the adult expected. Gently, gently, guide and suggest. Rule #9: Don’t feel guilt. 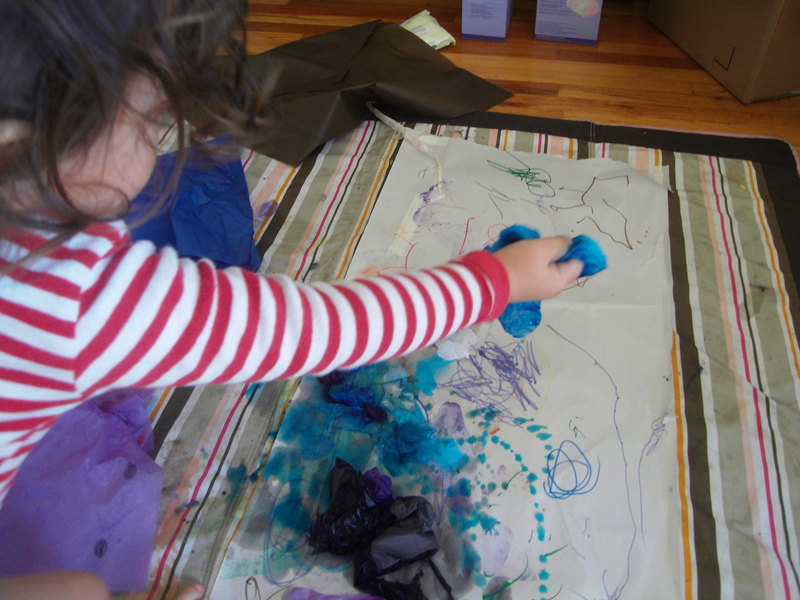 You may have guilt when applying child-centered art because you may have done crafts to the exclusion of art, guilt because you haven’t nurtured your child’s creativity enough – don’t do it. Start now with your children, grandchildren, adults you know, start with yourself. Rule #10: discourage “good” clothes. “Go to a thrift shop, buy your child two outfits for school. 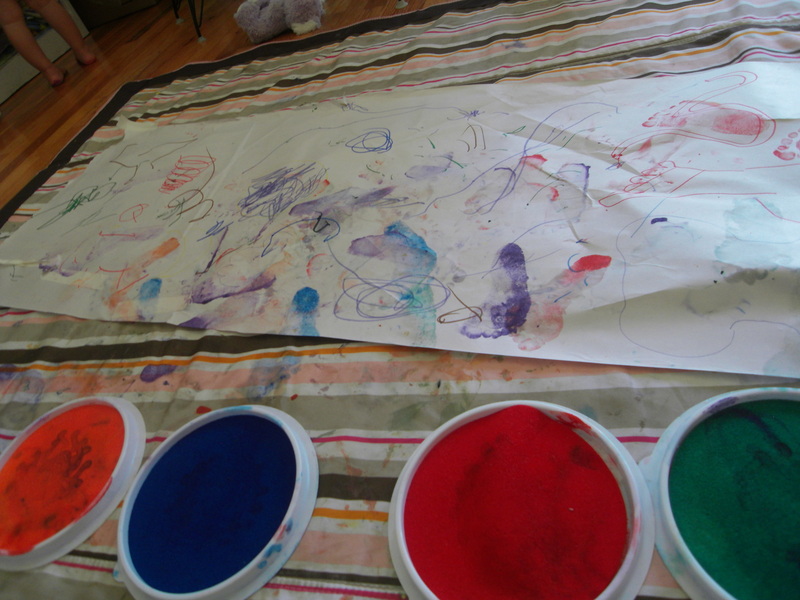 Then you’ll not be upset when the clothes come home with paint all over them.” To heck with aprons. I came across NVC as part of my parental research via finding information on emotional intelligence. There have been numerous studies that have proven having a high emotional intelligence leads to greater success in life. It is much more important than having a high IQ. Since I would like Mishy to have as many possibilities, I devoured this book written by Marshall B. Rosenberg. This is the one book that has been so challenging for me to try and implement in my life. I am still in process and probably will be for the rest of my life since we are surrounded by “violent” forms of communication. Non-Violent Communication, also known as Compassionate Communicate, operates from a place of empathy. There is no right or wrong, good or bad, we are all people who strive for love and empathy even if we communicate in ways which seem otherwise. Its’ philosophy is in the same vein as Martin Luther King and Ghandi. To practice NVC, both parties don’t have to be versed in the language. If you offer empathy to someone, it is surprising how a dialogue can happen and healing begins. Though I was skeptical at first since the language reads quite formal on the page, it does work and has made my life easier and more loving. I recommend this book not only for parents, also anyone who strives for healthier ways to communicate. Currently, a group of mothers and I meet every few weeks to practice NVC in my backyard. It is incredibly fulfilling to be a part of this group. Any practice group can be started – just grab a group of people who are interested in learning about it. 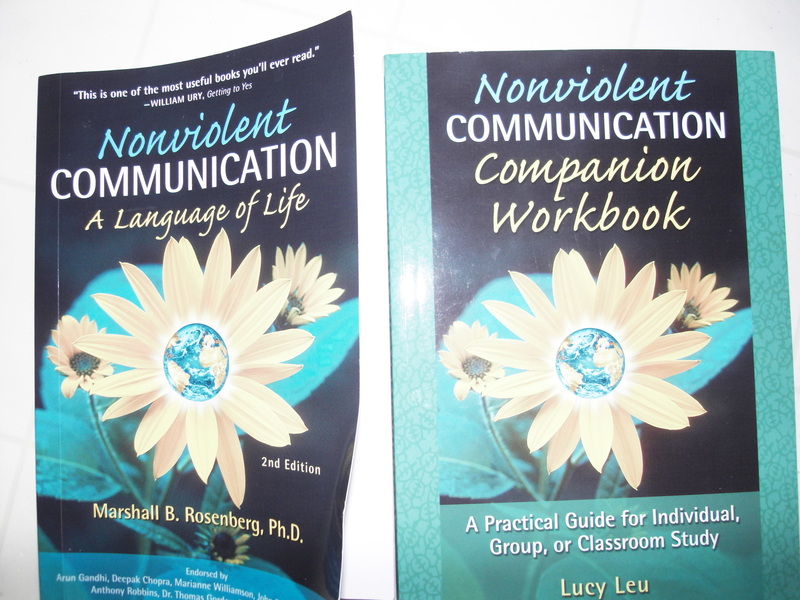 The Non Violent Communication Companion Workbook by Lucy Leu has activities broken down by chapters and is highly recommended because to practice NVC is quite different than reading about it.